This article originally featured on CSIS cogitAsia and is republished with permission. Read it in its original form here. The recent decommissioning of the aircraft carrier INS Viraat leaves an enormous gap in the Indian Navy’s power projection capabilities. 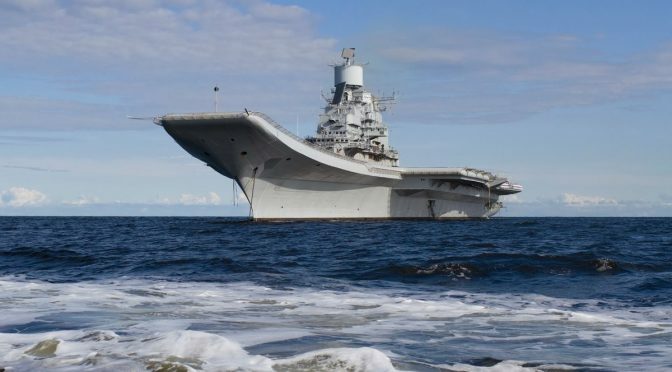 India’s sole remaining aircraft carrier INS Vikramaditya will now serve at the vanguard, as evidenced this year by the ongoing Exercise Malabar and the earlier held TROPEX (Theater Readiness Operational Exercise). TROPEX reflected a shift in the mindset of Indian strategists from focusing exclusively on maneuvers for protection of the immediate littoral to combat concepts fixated around a larger maritime theater. It was a departure from considering Pakistan its main adversary and suggested an increasingly significant emphasis on China as the primary strategic threat. The Indian Navy’s plans to establish two carrier task forces affords it a limited window to finalize the design for its second indigenous aircraft carrier given the protracted schedule required to construct and operationalize a carrier battle group. In the past decade, there has been a general change in strategic thinking in both Beijing and New Delhi. Policymakers have realized the importance of having dynamic maritime capabilities. This reflects a major doctrinal shift in the grand strategy of the two nations, which have usually revolved around developing traditional continental forces aimed at countering threats along their land borders. In this regard, the People’s Liberation Army Navy (PLA-N) has increased investment in naval forces and has established dominance over its regional waters. The PLA-N is asserting its naval power in the South China Sea and is simultaneously holding live-fire exercises in the open seas from the southeast Indian Ocean to the eastern Pacific. These actions threaten the overarching security situation in the wider maritime theater, and countries in the region are growing progressively uncertain about China’s intentions. The capabilities of most navies in the wider maritime theater are paltry in comparison to the PLA-N — and China plans to continue its naval build up. Given this escalating security dilemma, the Indian Navy is the only resident power in South Asia that has the resources and capabilities to counter the emerging strategic imbalance in the maritime theater. The Indian Navy had previously taken a defensive approach and concentrated resources on developing credible anti-submarine warfare (ASW) capabilities, as the immediate concern for the strategists in New Delhi was Chinese submarines roaming in their backyard. Despite a change in thinking, the commitment of the Indian Navy to see its new maritime doctrine through from defense white papers to the open waters hangs in doubt, given the history of bureaucratic delays, inefficient procurement, and ineffectual financing. The delay in its indigenous aircraft carrier program is a prime example. China is clearly moving ahead of India, with plans to induct its second indigenously produced aircraft-carrier into service before 2020. Meanwhile, India has struggled to meet deadlines for the INS Vikrant, its first Indigenous Aircraft Carrier (IAC-1). In this race of aircraft carriers, India’s only saving grace could be the follow-on project, INS Vishal (IAC-2). This single supercarrier may push India to a dominant position in the long-term fight for naval superiority with China over the maritime commons of the Indo-Asia-Pacific. Vishal could possibly be the first nuclear powered supercarrier built in Asia. The discussion around the Indian Navy’s maritime strategy is centered around the IAC-2 to such an extent that it has decided to shelve plans to develop an indigenously produced aircraft in favor of procuring a better multi-role fighter aircraft that would suit the capabilities of the Vishal. The Vishal’s main selling point is its proposed nuclear propulsion engine. Russia, India’s long-trusted defense and arms supplier, jumped on board to deliver the aircraft carrier, and the Indian establishment has also sent letters of request to multiple European nations. There is also the possibility that India may shun foreign reactors altogether and built its own indigenous reactor for marine propulsion. The United States, however, is poised to be the preferred partner in this initiative as it holds the most advanced technology for nuclear propulsion in aircraft carriers, and India has progressively increased its defense cooperation with the United States. Toward this end, India and the United States signed an agreement to share research and technology for an aircraft carrier that fits these requirements. The other area of cooperation in this partnership would be fitting the Vishal with the Electromagnetic Aircraft Launch System (assuming nuclear propulsion), which would allow it to launch heavier aircraft like larger fighters, airborne early-warning aircraft, and refueling tankers. Ultimately, in the long-term, the future of the Indian Navy will be built around the INS Vishal, and it is imperative that the strategists of New Delhi realize that this single venture will decide the fate of the navy’s ambitious modernization plans. The planning and design for Vishal is still in its initial stages, and this has led to delays in procurement of support vessels that will make up the carrier strike group. The success of this program depends on the Indian establishment shedding its previous inhibitions and adopting a more steadfast attitude to the rise of Chinese naval power in the Indian Ocean. It requires the government of the day to engage the United States in transferring technology never made available before, even to close allies. Most importantly, if India is to deploy carrier strike groups to both of its maritime frontiers — the Arabian Sea and the Bay of Bengal — it must develop better manufacturing facilities and realize the costs underlying its most ambitious project yet. The cost of building and maintaining a nuclear carrier strike group will run into the billions and would require a significantly larger allocation of the defense budget to the navy. Prime Minister Narendra Modi’s government has given priority to India’s maritime interests in the entire Indo-Asia-Pacific, and the comments of an Indian minister supporting freedom of navigation and overflight in the disputed waters of the South China Sea supplement this view. India Naval Chief Sunil Lanba has touted India as a “net security provider in the Indian Ocean.” A 65,000-ton supercarrier would give India the ability to achieve it all but, for this to become a reality, New Delhi must shed its traditional lethargy and shake things up. *The Russian Federation/USSR was the original manufacturer/operator of the carriers. ^The estimated times are for the year when the carrier is scheduled to be commissioned. Mr. Tuneer Mukherjee is a former intern at the Asia Maritime Transparency Initiative at CSIS and holds a master’s from the American University School of International Service. Follow him on twitter @MTuneer. It would be a white elephant which the navy would never commit to combat in case it might be sunk. I doubt that, the Indian Navy draws on Royal Navy tradition and has had no problem conducting dangerous operations or risking major fleet units. Yes? The Indian Navy has been used exactly one time in combat. That was in 1971; in 1965 the entire Navy was kept hidden in harbour though the Pakistani navy shelled Dwarka. In 1971, the aircraft carrier INS Vikrant should logically have been used to blockade Karachi. Instead it was hidden in the Andamans until the only Pakistani sub capable of reaching the Bay of Bengal, the Ghazi, was confirmed sunk in an accidental explosion of Visakhapatnam. And then it was used to bomb Cox’s Bazar and Chittagong, both of which could have been, and were, being hit quite adequately by the Indian Air Force. Meanwhile, the navy attacked Karachi harbour twice using missile boats – hardly “major fleet units” – and cancelled all plans for a third attack as soon as the frigate Khukri was sunk by the Pakistani submarine Hangor. The Indian Navy is a ceremonial force, and its abysmal record of maintenance mishaps reinforces that fact. In a full scale war with Pakistan – especially in today’s missile environment – it will stay snugly hidden in harbour, like it did in 1965.